In 2010 I was 14 years old and I disclosed to my Mother the sexual abuse being perpetrated against me by her partner for the past two-years. I was taken to the police station and from there my life was turned upside down. I had no idea how detrimental the abuse and court process would be to my mental health. In 2011 I was cross-examined for three days as part of a fourteen-day trial relating to the abuse. During this time, I was provided with Professor Caroline Taylor’s book ‘Surviving the Legal System’ by my school counsellor. I relied on this book for information for several years following the trial as my abuser continued to stalk me and I inevitably relocated interstate in 2015. I found out about Children of Phoenix when searching for Professor Taylor’s biography and contact details to thank her for her book. I was inspired by her story and pursued a tertiary education following high school. 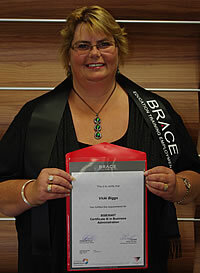 I have now graduated from a Bachelor of Laws. Without the financial support of Children of Phoenix, I don’t know if I would have finished my studies. The support of Children of Phoenix, through the ‘Suzanne Burnham Scholarship’ alleviated the significant financial burden of studying. While I maintained part-time and at stages full-time employment throughout my studies this was only enough to meet my living expenses. The Children of Phoenix scholarship met the costs of my university text books, travel expenses of commuting to university and placements and the cost of my laptop. I also had the opportunity to study on exchange for three weeks at the University of Oxford in 2016. I am so sincerely grateful to all those who have contributed to my scholarship. My qualification means that I am now able to pursue a career in the family law/child protection field and I hope that I can help families during this very difficult and stressful time. I now endeavour to be admitted to practice as a lawyer and I am currently undertaking a Diploma of Legal Practice. Thank you Rebecca for your kind words and the lovely photo of your graduation that you sent to share with board members. Children of Phoenix Scholarship Committee. I recently attended a ‘Working with Survivors of Sexual Abuse’ workshop by Professor Caroline Taylor AM. It was based on her book ‘Surviving the Legal System’, and focused on vital aspects of disclosure and non-disclosure by victims. Above all, emphasising how important support for victims is. I have attended many workshops over the years, but this was by far the best I have attended. I was astounded at how authoritative and credible Professor Caroline’s presentations were. She lectures to Police Forces and Judiciaries around the world and is highly acclaimed as an author and advocate in the field by her peers. This is clearly because she is painstaking in her research and gives added credibility as a survivor herself. I think she is a hero to survivors of sexual abuse for such outstanding education and advocacy. Chaplain Ballarat Specialist School & survivor of sexual abuse. My name is Vicki Biggs and as a recent recipient of one of your scholarships, I am writing this letter to you to say a huge thank you to you for creating this wonderful foundation. Without your foresight I would never have had the opportunity to go to school and learn all the wonderful things that doing my Certificate 3 in Business Administration included. I would like to thank you, your Board and Scholarship Committee and especially the Sponsors who without their backing these scholarships wouldn’t be possible. I have to admit that without Children of Phoenix encouraging me to take this huge step, I would have never have done it. For I didn’t think that I was worthy, nor did I think that I had the brains to do it, and I certainly didn’t have the funds available. I have always worked hard at my jobs and I often dreamed of having my own business one day, but as I never even got to finish secondary school, these dreams were just that, Dreams. So for me to go back to school at the ripe old age of 50 and to get the chance to learn skills that will help me start up my own business from home means so much to me. Not only did I learn a lot of skills for my job, but I also got a whole lot more. I got so much support from this foundation, as you allocated me a mentor which definitely helped me. The self-worth that comes with learning, is unimaginable. The doors of opportunity are endless and my confidence in myself has made me think of a whole lot of other avenues that 12 months ago I would never have even thought about. The teachers at Brace were fantastic, they not only taught the classes but they also helped in any way they could to make sure that we got what we needed to get the subject done, they even helped some of the class members write up their CV’s, and told them of jobs that were coming up in the system that they knew of, the class members have remained good friends even after finishing school. These may only seem small items but believe me when I say that they made a huge impact on me. To all the Sponsors, a very grateful heartfelt Thank-you, because without your funding, these ideas are just that ideas. I am so proud to be able to say that I’ve done it, I have graduated with a certificate to prove it. Don’t ever under estimate the difference that a dollar or two will do for someone’s future. It makes huge difference. To have the course fees paid, to be able to get books without wondering how are you going to afford it, to be able to receive stationary or petrol to help you get there, these are just some of the things that your money has done for me and others like me. It should do your hearts good to know that you are making someone’s future a much bigger and brighter place. So from a very proud Children of Phoenix Scholarship scholarship recipient, I say thank you and wish you all well into the future. May your dreams become reality, and may life be kind to you all. This letter was sent to Professor Taylor and the foundation from a survivor in July 2011. The letter has been edited to protect the identity of the writer. I just had to write and acknowledge YOU as the inspiration for me to pursue further study. Your story was such an inspiration to me and finally gave me the motivation to say to myself ‘if she can do it so can I’. I got kicked out of home at 14 because of sexual abuse and basically became homeless and lived where I could find a bed – I had no home!!!! Most of the time no- one cared about me, or knew where I was. I had lived in 106 places from the time I was 14 until I was 22 (and still didn’t have a HOME. I had a rough life but did find a partner and settled down somewhat to have children who are lovely, balanced people.The motto (hope) that got me through all the bad times was basically the same as yours – you cannot choose the family you are born to, you can however make YOUR LIFE great and make a difference in the lives of others – and that was the thread of hope that got me through my teenage years. NOW – I have just turned 40 and off to university I go for a chance to offer hope and help to those trying to deal with the multitude of problems associated with CSA and make a difference in peoples lives as YOU have done. Craig**Please note this letter has been edited to protect further the identity of the writer who asked only that his first name be used. 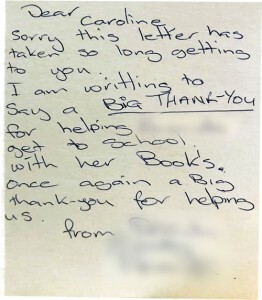 Letter of appreciation from a survivor:I am writing to say a very big Thank You to the following people who are tirelessly working for the foundation called the “Children of Phoenix.”This foundation was established by Dr. Caroline Taylor with the vision to help both children and adults who are survivors of sexual abuse. 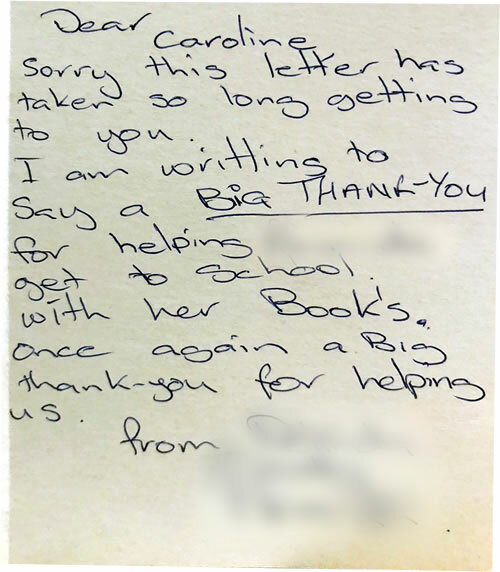 Being a survivor herself of terrible childhood abuse, Caroline decided that a foundation was desperately needed to pass on the important and lifesaving educational skills that gave not just formal education but the ability to broaden horizons of life etc. Dr. Taylor wanted to see a foundation that would help others grow and reach their full potential and to ensure they did not travel alone, as she did. Her foundation is growing and I would also like to thank Rachel Kinscher who is the executive director, and Sharon Mudge, who is a board member of this wonderful foundation. The help and assistance and positive support that all these lovely ladies have shown me, has not only given myself but other survivors just like me a chance of a new start, with tools to help getting started along the way. I don’t know of any other foundation that willing gives you the opportunity to get back to school as an adult and take courses so that you can get an education to make a new start in life, complete with help and continuing support along the way, all with no strings attached. What a wonderful and generous idea.From reading Dr. Taylor’s work I understand her passion that this was the best way to help others to achieve and to heal. I hope that Ballarat businesses and the general public realise how fortunate they are to have this wonderful facility in their own backyard, and I hope that everyone will get behind this foundation and help it grow into something that all Victorians will be proud of. Lots of other volunteers help with this foundation and all I have met since the foundation began to assist me, have been nothing but kind, gentle and supporting. Well done to everybody who helps this foundation, either with time or donations. You are all doing a great job. Letter of appreciation from a funding recipient:On November 29th 2007, Young Women’s Secure Welfare opened its annual art exhibition as part of the International 16 Days Against Gender Violence. The exhibition is an annual art therapy event that raises awareness about sexual violence within Victoria and gives young women survivors of violence the opportunity to express their experiences in a safe and supportive environment. Each year the show aims to raise funds for new resources to ensure the ongoing operation of the art therapy program at Secure Welfare. The goal of the 2007 Inside Out exhibition was to raise funds to purchase a computerised baby to address the problem of adolescence pregnancy. The Children of Phoenix Foundation realised this goal for us by generously donating a computerised baby, in addition to providing training to the staff at Secure Welfare in the operation of the resource. The magnitude of the donation far exceeded our expectations and has provided many young women across Victoria with the opportunity to make an informed decision about pregnancy. Jane (14yrs), a client of Secure Welfare who attended the first session of using the computerised baby stated that ” The baby was so cute, but it freaked me out when it started crying and I couldn’t stop it…it better playing with my friend’s kid…after the group with the baby, I’ve decided that I don’t want a baby all the time…not yet”The art therapy program at Secure Welfare facilitates the creative process of making art that is healing and life-enhancing. The program focuses on increasing self-awareness in order to cope with traumatic experiences, and to enjoy the life-affirming pleasures of artistic creativity. The Children of Phoenix, by donating one thousand dollars to the Art Therapy Program, has assisted young Victorian women to access this service when held in Secure Welfare. The program relies heavily on community contributions for its ongoing operation and without the generous support of organisations such as the Children of Phoenix would find it difficult to continue its valuable work with such vulnerable young women. The foundation’s support was the largest donation for 2007 and has consequently funded art materials for four months. On behalf of the staff, the young women and the art therapy program I would like to express my ongoing gratitude to the Children of Phoenix Foundation for providing to our service such a wonderful educational resource as the computerised baby as well as essential art supplies. Their generiousity demonstrates an active and genuine approach to supporting individuals who are victims and survivors of gendered violence.